The Scottish Young Lawyers’ Association (SYLA) held their annual conference on 24 June 2011 at The Corinthian Hotel in Glasgow. Phil Knight of Biggart Baillie presented on how Twitter has allowed him to develop a strong personal brand and network within the Scottish legal profession. He reported, also, on some lucrative results for his firm, with a measurable amount of fees coming directly from his own activities on Twitter in the past year, mainly from referrals from other contacts. Not only did Phil explain the benefits of using Twitter for his career, he also took the audience through the basics and some of the more advanced features of twitter, in addition to making reference to a list of top 100 legal tweeters in Scotland which was helpfully prepared before the event. For further discussion of social media policies I would highly recommend David Morgan’s Linkedin group Employment Law for Human Resources in Scotland, where David of Burness LLP has recently been sharing his thoughts on how a professional social media policy should be drafted. Brian Inkster of Inksters then spoke about his firm’s experiences, together with some of his own tips on how lawyers can use social media effectively. Brian has already written about the event with commentary on his own presentation on the Inksters website which is well worth viewing. “I think it makes sense to see the firm’s Twitter account as the giant battleship at the centre of a convoy. What is really needed is some more nimble destroyers, which are perhaps less powerful, but can dart around and engage the enemy where needed. Through various slides, as per the above SlideShare presentation, Brian then led the audience through a chronological display of some of Inksters’ most significant tweets and other online developments. One of the interesting comments Inksters have received is that they are perceived by some to be a much larger firm than they are because of their powerful online presence. Brian outlined the consequences of Inksters tweeting and compared the main social networks, with LinkedIn being seen as more professional and perhaps, as a result, more boring than Twitter, with FaceBook being for old friends rather than new connections. Given that Brian is the founder of The Time Blawg, he gave some useful insights into law blogging, advising the young lawyers how easy it was to set up and publish a blog using the likes of WordPress, which is the platform used by The Time Blawg and this, WardblawG, among many others. Following this, I presented on some of my own experiences of using social media. First, I explained my own path from qualifying as a solicitor at Maclay Murray & Spens LLP in 2010 to becoming engaged in blawging in order to share some of own legal knowledge and engage more with the legal profession, which all resulted in me becoming a search and social media consultant to law firms at Moore Legal Technology. The main benefits of Linkedin for lawyers were explained as being greater online presence particularly through search engines, the ability to build and develop a professional network, generate new business directly or via referrals and also with the opportunity to scope out competition. I then presented on the top five reasons for young lawyers and barristers to get blogging. I also suggested that if lawyers are interested in blogging, they would be more than welcome to register on my sister site Youblawg, which is currently housed at https://wardblawg.com/youblawg. After registering for free via the upper right section of the site, they will get access to post blogs or see how other blog posts look before getting published, at least from a WordPress perspective. If looking to set up a standalone blog, please get in touch with me via the contact form and I can answer any queries. Brian, Phil and I were then involved in a Q & A session, facilitated by Martin Raymond of Cloudline, with interesting discussions generated regarding, amongst other things, What not to tweet, Twittiquette and conflict within law firms between the partners and younger tweeting lawyers, with additional discussion regarding the regulation of social media both at firm level and on a more global level. For a full feed of all the updates from the SYLA conference see the hashtag #SYLAAnnualConference or #SYLAConference. 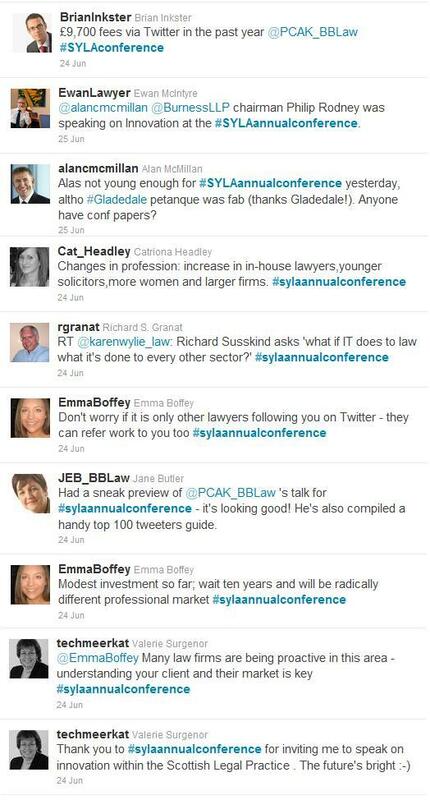 As Brian suggested, next year’s conference should probably use the hashtag #SYLA2012 – the shorter the better.